There have been many Trailblazers throughout history. But perhaps none has loomed larger, or longer, than Leonardo da Vinci. From art, to science, to math, to technology, hear just how disruptive his contributions were—and still are—in this special episode. Can a man be more than a genius? In the case of Leonardo da Vinci, one of the finest polymaths the world has ever seen, the answer is a firm yes. Endlessly imaginative, the self-taught Italian’s insatiable curiosity led him to invent novel ways to draw, sculpt and paint that led him ever closer to encapsulating the perfection he envisioned in his mind. But perhaps his greatest gift for impossible productivity? Procrastination. Both a charming conversationalist, and a lover of nature, Leonardo –a vegetarian before it was hip –would purchase live birds at the market for the purpose of setting them free. Da Vinci was fascinated by flight. For two decades he filled notebooks with over 500 drawings and 35,000 words on things that take to the skies. Where fantasy blended with reality, Leonardo was able to imagine connections between all things –living, dead and celestial. Today, it’s impossible to think of da Vinci without the Mona Lisa, merely the wife of a wool merchant in Florence. A commissioned portrait, da Vinci held onto the work himself and never collected his fee –a perfectionist, and a man out of time, who kept adding strokes till death. It was this unquenchable desire to understand everything, to document his findings, and to synthesize what exists into something that doesn’t, that makes him a true trailblazer. Dell Technologies (DT): Some may find it strange that a technology company is producing a podcast episode about Leonardo da Vinci. What would you tell those people about why da Vinci is relevant today, even in the tech space? Walter Isaacson (WI): Innovation in technology comes from being able to connect engineering and the arts, by being able to connect the technology to beauty and our human emotions. That’s what Leonardo did, and that’s why he’s so relevant to today. DT: In interviewing the many Leonardo scholars for this episode, we found that there’s some disagreement about whether he could thrive today. Some said the digital age we live in is too different, and some say he’d be at home in the space of art and technology. What is your opinion? WI: The age of the digital revolution—with the Internet, communications networks, and our ability to form social networks and have ideas rush around the globe instantly—is in a way like the Renaissance, which came about because of the fast spread of knowledge, because of the printing press, because of people questioning conventional wisdom. So I think Leonardo would love to have lived in our time. He was very lucky to have been born just as the printing press was coming along, just as Gutenberg was opening up his shops to print books. But imagine somebody who wanted to know everything there was to know about everything that could be known being born in the age of the Internet. Somebody who understood beauty, but also understood technology. Somebody who thought of himself as an engineer, but also as an artist. He would certainly be a mix of Steve Jobs and Bill Gates and Elon Musk and Jeff Bezos, all rolled into one. He would’ve really, really loved being a 21st century man. DT: We talked in the podcast about the traits Leonardo held that we could all aspire to hone today. Would you say any of those are particularly relevant for today’s business leaders? WI: I think what Leonardo teaches us first of all is to question conventional wisdom… be a bit of a rebel. Say, “Let’s do an experiment. How do we know that?” The other thing he taught us is that it’s all about the product. You don’t try to just satisfy patrons or make as much money in the short term as possible. If you make great products, that’s how you’re going to succeed. So I think there are a lot of lessons somebody in a start up or an enterprise can learn from Leonardo. DT: How has what you’ve learned about Leonardo da Vinci most impacted you personally? WI: After studying Leonardo for all these years, and reading his notebook pages and looking at his great art, I realized I’ll never become a genius like Leonardo. But as I walked down the street, I found myself being a little bit more careful as an observer. I’d look at light and how it struck an object, and I’d try to figure out the way the shadows were formed. Or I would be curious about how a bird’s wing goes up and down, or maybe the way a dragonfly moves. Or maybe I’d be sitting at dinner, looking around the table at each person’s gestures and seeing how those gestures connected to their inner emotions. Or maybe a smile would flicker across a person’s face, and I would try to fathom her inner feelings, as if she were the Mona Lisa. Now, none of us will ever be Leonardo. We’re not going to paint, “The Last Supper.” But all of us, I think, can have much more enriching lives if we just try to capture a little bit of his curiosity, his willfulness about observing things, and his openness to the wondrous mysteries of the infinite things that nature has created. Click here for more information about Walter Isaacson’s new book, Leonardo da Vinci. The interviews for this episode of Trailblazers were conducted at the “Leonardo da Vinci: A Celebration of Wonder, Imagination, and the Creative Power of Curiosity” conference at the Aspen Institute this summer. You can check out the videos from the event here. 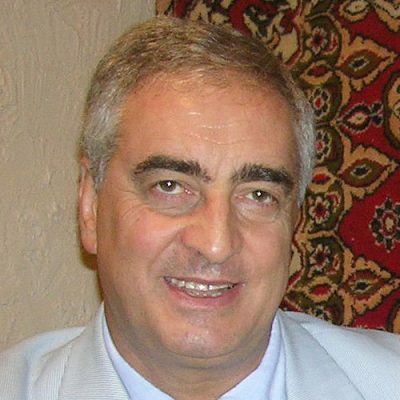 Marco Cianchi Marco Cianchi has been teaching art history at CSU-IP-Florence since 1985. He is the author of Leonardo da Vinci's Machines and Leonardo Anatomy. 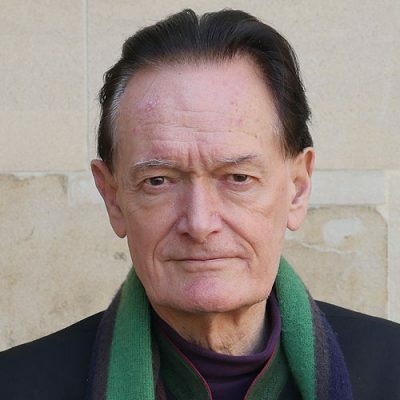 Martin Kemp Is an emeritus professor of the art history at Oxford university who specializes in the the life and works of Leonardo da Vinci and Renaissance culture. 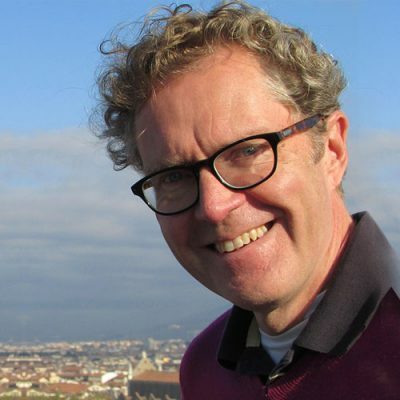 Ross King Is an art historian and bestselling author of several books including The Fantasia of Leonardo da Vinci. Gary Radke Is an emeritus professor of Art History at Syracuse University and author of Leonardo da Vinci and the Art of Sculpture. Jeff Koons Is a bestselling artist who in collaboration with French fashion house Louis Vuitton designed a series of handbags featuring the reproductions of his favorite masterpieces by Leonardo da Vinci. 0:05 – This is Milan, in northern Italy, more than five centuries ago. Its ruler has just received a letter from a 30-year-old Florentine in which the writer lists the reasons why he should be given a job. In the first 10 paragraphs, he touts his engineering skills, including his ability to design bridges, waterways, cannons, armored vehicles, and public buildings. Only in the 11th paragraph, at the very end, did he add that he was also an artist. 0:39 – Likewise in painting, he wrote, I can do everything possible. Yes, he could. His name was Leonardo from the town of Vinci, and in years to come he would create the two most famous paintings in history, “The Last Supper” and the “Mona Lisa,” as well as history’s most famous drawing, “Vitruvian Man.” At this point, though, the 30-year-old was enjoying only modest success as a painter in Florence and he was having trouble finishing his commissions. 1:14 – He was searching for new horizons, perhaps as an engineer. The letter listed all of his vocational skills but it could not possibly capture his extraordinary mind and the unfettered curiosity that fueled it, so much of which is revealed in Leonardo’s notebooks, more than 7,200 pages of which survive to this day. These notebook pages form the basis for my recently published biography of Leonardo. I read them through, I enjoyed every moment of it, and I had the excitement of seeing his mind at work. 2:00 – Every inch is crammed with drawings providing glimpses of his mental leaps, scribbled alongside each other. With rhyme, if not reason, are math calculations, sketches of his devilish young boyfriend, birds, flying machines, theater props, and sawed apart skulls. Leonardo’s notebooks have inspired countless innovators throughout the centuries, including Bill Gates, who in 1994 bought 72 pages of these notebooks for over $30 million. 2:33 – Last chance. Yours it is at $30 million. Well done. 2:36 – He keeps it in a beautiful library in his house near Seattle and I remember him showing it to me and we discussed why there should be a biography of Leonardo based on these notebooks. These notebooks are a reminder to me of the importance of taking notes on actual paper because 500 years later, Leonardo’s notebooks are still around to astonish us and inspire us. 50 years from now, our own notebooks– if we work up the initiative to start writing them– will be around to astonish and inspire our grandchildren, unlike our tweets and Facebook posts or even this podcast. 3:22 – Leonardo was in every sense a Renaissance man, yet as I tried to show in my book and I hope to show in this podcast, his passion and the lens through which he saw the world provide tools that equip us for life, work, and disruption in the 21st century. Almost 500 years after his death, there is still much that Leonardo can teach us. I’m Walter Isaacson, author of the new book “Leonardo da Vinci,” and this is a special episode of “Trailblazers,” an original podcast from Dell Technologies. 4:06 – It’s easy to use the word genius when talking about Leonardo da Vinci. After all, he was wildly imaginative, passionately curious, and creative across multiple disciplines. But we should be wary of that word. Slapping the genius label on Leonardo oddly minimizes him, making it seem as if he were somehow touched by lightning. And that would be a lost opportunity for us. His genius was the type that we can understand, even take lessons from. 4:38 – It was based on skills we can aspire to hone in ourselves, such as curiosity and intense observation. It was this marrying of observation and imagination that would make him history’s consummate innovator, the original trailblazer. Leonardo’s life began on a spring night near the Tuscan village of Vinci, where a 16-year-old unmarried orphan girl gave birth to a son. The child’s father, Piero da Vinci, was a notary based in Florence. 5:21 – The mother was Catarina Lippi, whose identity and background have only recently been rediscovered. That the two never married was a stroke of luck for Leonardo. His so-called illegitimacy carried little shame at the time, but it did free Leonardo from the expectation that he would become a notary like his father and grandfather before him. Better still, it liberated Leonardo from the need to attend a Latin school, as was expected by the well-groomed aspiring professionals and merchants of the early Renaissance. 6:00 – Other than a little training in commercial math, Leonardo was mainly self-taught and he would end up forming his own views of the way the world works. Fast forward more than a decade and we find Leonardo in Florence working for Andrea del Verrocchio, a versatile artist and engineer who ran one of the best workshops. His years in Florence– a vibrant center of art, engineering, and ideas– were formative. Ross King is an author and art historian. 6:36 – Suddenly, he fetched up in Florence, which in the 1460s really was the intellectual and artistic capital of Europe. And his introduction to it was affected by Verrocchio, who there is the good evidence was a musician himself. He loved music. There were musical instruments in his home. He was also very literate and had a collection of books. And so Leonardo first and foremost would have come into a kind of intellectual milieu which he could not have had in Vinci. 7:09 – Florence became the birthplace of Leonardo’s insatiable desire to understand every facet of the world around him, a trait that would define him for the rest of his life. A lesson we can learn from Leonardo’s early days, as well as from the rest of his life, is that when it comes to the world around us, we should be curious– relentlessly curious. I have no special talents, Einstein once wrote to a friend, I am just passionately curious. Leonardo actually did have special talents, as did Einstein, but his distinguishing and most inspiring trait was his intense curiosity. 7:54 – He possessed endless wonder about how everything worked, something that each of us can push ourselves to do every waking hour, just as he did, and can inspire us to create extraordinary things that help us make sense of the world around us. I relish the time that I got to have a private viewing of one of these creations five centuries after it was made. In a room down this corridor is the world’s most famous drawing, a work both universally recognized but rarely put on public view. 8:34 – It is kept in a locked room on the fourth floor of the Galleria dell’Accademia in Venice. 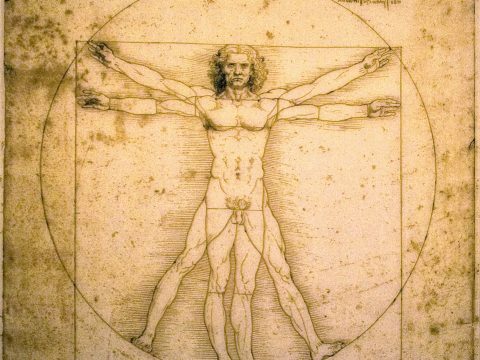 It’s Leonardo’s “Vitruvian Man,” his iconic drawing created around 1490 of a man spread eagle inside a circle and a square. The drawing is a scientifically accurate representation of the proportions of the human body as if standing within the Earth and the cosmos. And the man himself is a figure of almost unnecessary beauty, with curls and well-built shoulders. And you realize that it’s actually a self-portrait. 9:20 – It’s Leonardo drawing himself standing in the world and in the universe. This rare opportunity to have a private viewing of “Vitruvian Man” was a privilege I shared with the author and scholar Marco Cianchi who worked as a translator for my book and also became my friend. 9:45 – We went there together to the Academy Galleries in Venice, and we went to the drawing cabinet. And they took out, they came out of a door, with this folder and they opened it in front of us. I must tell you very frankly, for a minute I thought for a second, what If I would grab it and tear it? Of course, I didn’t do it. You know but it was an idea that for just a second passed through my mind. And I remember that Walter was worried about him sweating, like we because it was the month of July in Venice and it was really very hot. 10:41 – So we’re all sweating and Walter leaning on that drawing, he said to me later, I was very much worried that a drop of my sweat could fall on the drawing, of course. 11:02 – When the curator brought the drawing out and placed it before me on a table, I was struck by the indentations made by the stylus of Leonardo’s metal point pen and the 12 pricks made by the point of his compass. I had the eerie and intimate sensation of seeing the hand of the master at work more than five centuries earlier. And one of the things that struck me was the role that collaboration and the sharing of ideas had in creating a masterpiece like this. 11:39 – Ideas are often generated in physical gathering spaces. While working through his ideas for “Vitruvian Man,” Leonardo’s inspiration came from hanging around a Renaissance court in Milan. It was a gathering place where people with diverse interests encounter one another serendipitously. Conceiving ideas was for Leonardo, as it has been throughout history for most other cross-disciplinary thinkers, a collaborative endeavor. That’s why Steve Jobs liked his buildings to have a central atrium and why the young Ben Franklin founded a club where the most interesting people would gather every Friday. 12:22 – What we can learn from all three of them is that while genius starts with individual brilliance and a singular vision, execution entails working with others. Innovation is a team sport. No tour of the works of Leonardo is complete without mention of one of his most ambitious projects, the horse monument that never was. He had won the commission in 1489. Paid for by the Duke of Milan, Ludovico Sforza, it was intended to be the largest equestrian statue in the world, a monument to the Duke’s father, Francesco. Art history Professor Gary Radke. 13:10 – In the Renaissance, they realized that there was one way to make a leader look more important and be as Roman as Roman could be, and that was to put somebody on horseback in a life-sized equestrian monument. There were only a couple of those that survived. So what Leonardo was going to be producing was a horse that was not only going to be the ultimate image of rulership, a man commanding this animal, but it was going to be at a scale that would be for the first time back to that of the true imperial glory of Rome. 13:51 – The design process took Leonardo almost a decade as he spent his days studying actual horses, measuring every aspect of them, sketching them from all angles. This colossal sculpture, it seemed, was going to be Leonardo’s legacy to the world, that is until history played a cruel trick. 14:22 – Sadly for Leonardo, he lost his 75 tons of bronze when war broke out in 1494. In times of war, you need bronze– not to commemorate past victories, but rather to ensure future ones by turning it into gunmetal. And that sadly is what happened to his bronze. It was taken away to Ferrara and turned into cannons to fight the enemies of Milan who were invading. And so Leonardo lost all of the bronze, lost the commission, and was given a kind of booby prize or consolation prize by Ludovico Sforza. 15:32 – Frescoes were a medium that his mentor, Veracio, had never used or taught. It required that paint be applied to wet plaster in order to remain fixed. Once a patch of plaster had been put on the wall, that area of the painting had to be completed in one day’s session before it dried and then could not easily be reworked later. For “The Last Supper,” Leonardo experimented with a new method. He painted directly on the dry plaster wall, which he coated with a layer of white lead primer. 16:10 – By mixing water-based and oil-based pigments, he hoped to add layer after layer of subtle strokes, building them up over weeks to create the shapes and tones he wanted. It was a logical approach for an artist notorious for working, retouching, and then re-re-touching his paintings. It was a slow-moving trait that gained Leonardo a reputation for often leaving projects unfinished, a trait that might actually teach us one of the most unexpected lessons we can learn from Leonardo’s life, the value of procrastination. 16:52 – While painting “The Last Supper,” Leonardo would sometimes stare at the work for an hour, finally making one small stroke, and then leave. He told the duke that creativity requires time for ideas to marinate and for intuitions to gel. Men of lofty genius sometimes accomplish the most when they work the least, Leonardo explained, for their minds are occupied with their ideas and the perfection of their conceptions to which they afterwards can give form. Most of us don’t need advice to procrastinate, we do it naturally. 17:33 – But procrastinating like Leonardo requires work. It involves gathering all the possible facts and ideas and only after that allowing the collection to simmer. In 1498, “The Last Supper” was finally finished and Leonardo was given a nearby vineyard as a bonus. But after only 20 years, the paint began to flake and it became evident that Leonardo’s experimental technique was a disastrous failure. 150 years later, the monks noticed that the distance between the kitchen and the dining area was a long one and by the time their meals reached the table, they were cold. 18:18 – So it was decided that Leonardo’s painting was so faint and dissipated that it would be OK to break a doorway through the wall at the bottom, cutting right into the painting itself and cutting off the feet of Jesus. Over the centuries, six major attempts have been made to preserve and restore “The Last Supper.” Though the version seen today is more restoration than Leonardo, its powers are undiminished. Leonardo is widely described as a charming conversationalist and a lover of nature, renowned for being sweet and gentle to both people and to animals. 19:09 – An early biographer wrote that Leonardo, who was a vegetarian, would purchase live birds at the market for the purpose of setting them free. This was likely not just for humanitarian reasons, but for observational purposes as well. For among Leonardo’s many interests was the mystery of flight. Here’s a test. All of us have looked at birds in flight, but have you ever stopped to look closely enough to see whether a bird moves its wings upward at the same speed as it flaps its wings downwind? 19:49 – Leonardo did, and he was able to observe that the answer differs based on species. Leonardo wrote, there are some birds that move their wings more swiftly when they lower them than when they raise them, and this is the case with doves. There are others which lower their wings more slowly than they raise them, and this is seen with crows. 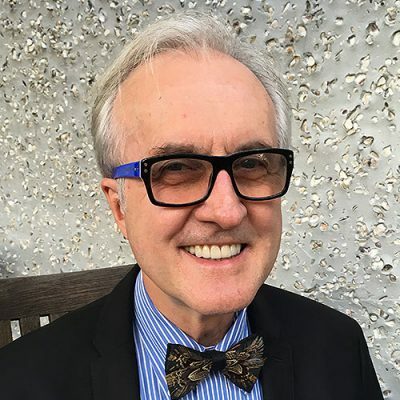 Leonardo scholar Martin Kemp. 20:16 – It doesn’t mean to say Leonardo invented flight, but what for me it meant is that he understood how by studying birds and bats you could arrive at a potential solution that was workable. He didn’t invent flight in that literal sense, but he knew where the answer lay. For me, one of the great glories of Leonardo is not getting the answer right, but knowing where the answer might lie, even if he’s not got the maths or technology to do it. He had a fantastic instinct as to what the solution might be. 20:47 – For two decades, Leonardo filled notebooks with more than 500 drawings and 35,000 words on birds, flight, and machines that might enable humans to conquer the heavens. Marco Cianchi describes the context Leonardo used to link birds with humans. 21:10 – A bird is a machine. In other words, he’s like a man. He’s constructed by God to fly and has incorporated a mechanical principle. And so this Leonardo investigates, he gets into the human body to understand the mechanism of the universe to which flying birds belong, a human being that’s walking belong, and so forth. So in other words, we are all related. I mean, it’s like there are strings that keep us together. Everything is organically represented. 21:54 – There are many lessons we can learn from Leonardo’s studies on flight, but perhaps the most key is the permission he gave himself to indulge in fantasy. He dreamed of man-powered mechanisms to flap a flying machine, and by doing so he blurred the lines between science and art and between reality and fantasy. It may not have produced a flying machine within his lifetime, but it did allow his imagination to soar. In 2003, Leonardo scholar Martin Kemp served as a consultant for a TV documentary, “Leonardo’s Dream Machines.” Based on Leonardo’s drawings, the team built a hang glider using the same materials available in the 15th century. 22:46 – It was arranged that we would go to the Sussex Downs near Eastbourne on the south coast in England, which is a very sloping area and there’s lots of hang gliders. We went there early in the morning, but hang gliding people were already out flying around in these machines and soaring in the sky. And Judy Leden, who was then the woman’s world champion hang glider, had come along to pilot this. And I thought, you’d never get me up in that. But anyway, she had more guts than I did. 23:14 – In a moment never before attempted, Leonardo’s theory of flight was put into practice. 23:20 – We did some test runs down the hill holding the wings tethered. It was really scary. She was seriously at risk. But it gave the most phenomenal lift and on the final run, it went further than the Wright brothers had gone, which was nice. 23:36 – Leonardo in his lifetime never realized the dream of human-powered flight. But to be fair, for the next 500 years neither did anyone else. In one sense, Leonardo could be as good at creating mysteries as unraveling them. Case in point, the portrait of a fabric merchant’s wife with the world’s most famous smile. Ross King. 24:08 – The interesting thing about the “Mona Lisa” is that many people wanted portraits from Leonardo, including Isabella d’Este, who was probably the greatest female ruler, the greatest female patron of art at the end of the 15th century, beginning of the 16th in Italy. And Leonardo was not interested in painting her. 24:27 – Leonardo never really danced to the music of patrons. He liked picking his own subjects, and by 1503, he just decided to paint what he wanted to paint. 24:40- He was interested in painting the wife of a wool merchant in Florence. And so this was clearly a painting that he wanted to experiment with. He could take away the painting of Lisa del Giocondo and he could experiment with it. He could enlarge on the original vision of it, which was maybe described to him by either Lisa or her husband, and he could then extrapolate from that and do what ultimately I’m sure was a completely different painting than what they were expecting when they asked for it in 1503. 25:16 – As it turned out, neither Giocondo nor his wife Lisa would ever receive the work, nor it seems would Leonardo ever collect his fee. Leonardo held onto the “Mona Lisa.” In fact, he would carry it through the rest of his life from Milan to Rome to France, adding tiny strokes and light layers. The “Mona Lisa” would be in the studio when he died. The lesson to be learned here, let the perfect be the enemy of the good– at least sometimes. 25:54 – Leonardo knew there were always improvements to be made to the “Mona Lisa,” even if viewers would never consciously notice they were there. Likewise, Steve Jobs was such a perfectionist that he held up shipping the original Macintosh until his team could make the circuit boards inside look beautiful, even though nobody would ever see them. Both he and Leonardo knew that real artists care about the beauty even of the parts unseen. Eventually, Steve Jobs embraced a counter maxim, real artists ship, which means sometimes you have to deliver a product even when there are still improvements that could be made. 26:42 – That’s a good rule for daily life. But there are some times when it’s nice to be like Leonardo and not let go of something until it’s perfect. The long-lasting impact of the “Mona Lisa” is living proof of that. Once a year, the “Mona Lisa” is removed from its case for close inspection. Leonardo scholar Martin Kemp got to be there on one of those occasions. For a scholar who had invested much of his life in studying Leonardo, the encounter brought an unusual tension. 27:23 – It arrived in the room and was put on a table in its frame and with its glass and its laid down face down. They removed the screws and so on that stop it falling out. They lifted it out and put it on an easel. I thought, this is really pretty scary. What if it doesn’t look very good or what if it’s disappointing or what if all this investment I put in this picture doesn’t pay off? 27:51 – As you might have guessed, Martin Kemp need not have worried. 27:56 – It was uncanny. It came out as a kind of living presence. This may sound very pretentious and kind of light art speak, but there’s no other way to describe it. And certain artists can get presence. Rembrandt can do that with self-portraits, where the figure doesn’t just seem to be a good representation on a flat surface, but seems to have a living presence and a communication. And the communication is quite unsettling in a way because you’re not quite sure what she is communicating, how she’s communicating. It’s left very ambiguous, but it’s spine-tingling. 28:35 – Leonardo’s ideas and exploration remain a product of his time, yet the more you get to know him and understand the extraordinary mind and glorious insatiable curiosity, the more he bridges the centuries. 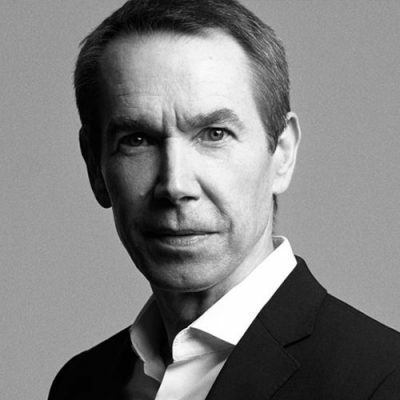 Jeff Koons has known spectacular success as a modern artist. His sculpture, “Balloon Dog,” a mammoth shiny sculpture that looks like, well, a balloon dog sold in 2013 for more than $58 million. That spectacular sale made it the most expensive work ever sold by a living artist at auction. 29:15 – On first glance, it might not seem like a link can be made between a classical artist like Leonardo da Vinci and the pop culture creations of Jeff Koons, but not according to Jeff. 29:29 – I love the idea of art history and I love the idea of having an understanding of people involved with art, the activity of art, what it can mean, what it can be. But I also love giving it up to things. I mean, I love finding and experiencing love. And I love admiring and find stimulation from Leonardo. And I love to give it up to that because that, I believe, is how transcendence comes about. 30:00 – And as Jeff Koons points out, Leonardo’s lasting value lies not just in the work itself, but also in what he teaches us today. 30:12 – He was a great human being, he was a great artist. He shows us that our interests can be vast and that we’re limited really to our own curiosity, our own resources and desire, passion for knowledge. And if we do try to seek out information, try to find greater understanding, that it will take us farther on a journey of having even, I think, greater curiosity and finding life more rewarding through the seekage of knowledge. 31:23Leonardo was a genius, but more he was the epitome of the universal mind, one who sought to understand all of creation, including how we fit into it. And there is much we can learn from him, even today. 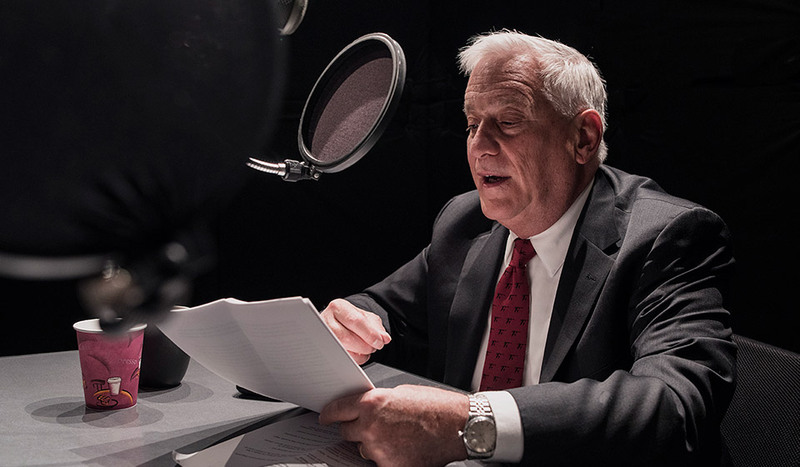 31:51 – I’m Walter Isaacson and this has been a special episode of “Trailblazers,” an original podcast from Dell Technologies. The interviews for this podcast were conducted at a conference at the Aspen Institute this summer. If you enjoyed the show and want to find out more about my book or get links to the Aspen Institute Conference, you can visit delltechnologies.com/davinci. 32:26 – On the next episode of “Trailblazers,” we’ll be looking at the world of grocery stores, from mom and pop shops to Amazon’s takeover of Whole Foods. We’ll look at an industry on the brink of the biggest disruption it’s ever seen. If you’re new to “Trailblazers,” please check us out on Apple podcast or wherever you get your podcasts. You can listen to previous episodes in the series, as well as subscribe to the show. If you liked today’s episode, please leave us an Apple podcast rating in the review. It helps new listeners discover the show. 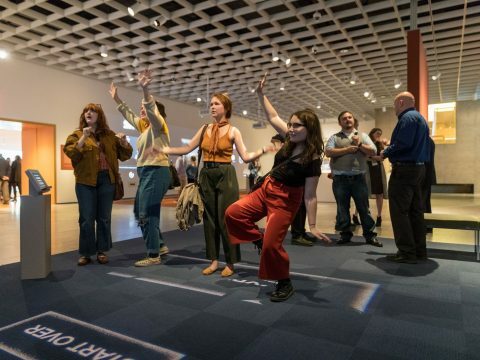 Art museums are diving into virtual reality, interactive touchscreens and holographic displays to re-invent how we interact with art. Five centuries after he lived, business leaders today can still learn from how Leonardo da Vinci viewed the world. Here are 8 lessons you can apply today. 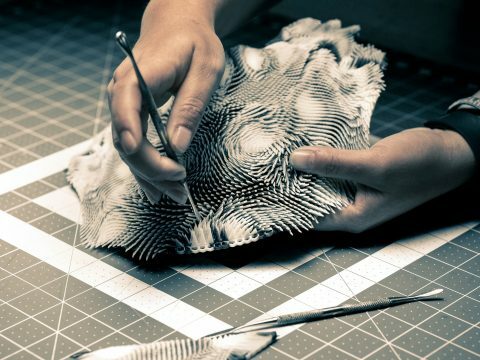 By sponsoring over 150 emerging artists in the Pier 9 Residency program, Autodesk sees what its design software is capable of in the right creative hands.